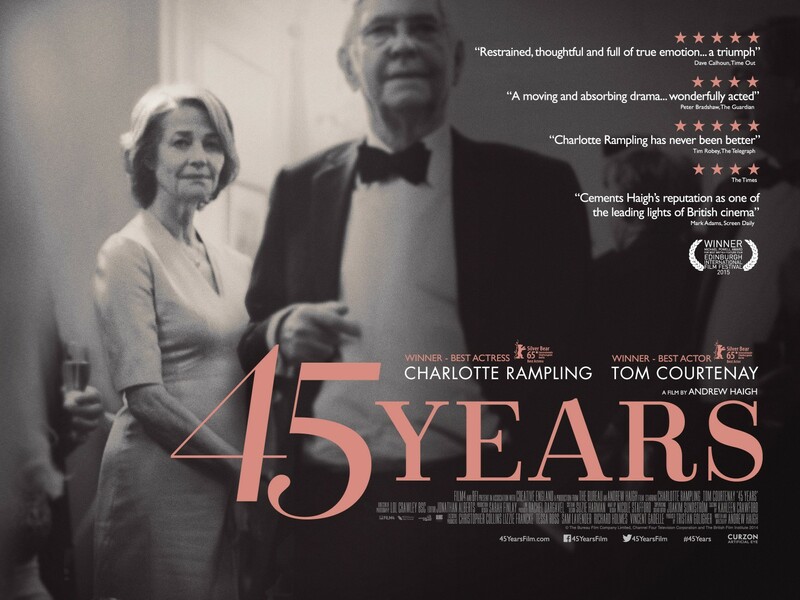 Andrew Haigh's 45 Years (2015) is misleadingly calm in its early scenes as it chronicles Geoff and Kate Mercer (Tom Courtenay and Charlotte Rampling) in the week before their 45th wedding anniversary. Geoff receives an unexpected letter with news that conjures up unsettled memories from decades past, long before his marriage to Kate, upsetting same with regretful revelations. One could argue that the entire film is intent upon reaching its final image where—at their anniversary celebration—Kate reveals her wounded, conflicted reaction to Geoff's seemingly misplaced regrets. Whether her reaction is oversized in relation to how long the two have been married, there's little doubt that Rampling's chances are sure at being included in Best Actress considerations during the upcoming Awards season. Anticipating same, the San Francisco Film Society offered a special screening of 45 Years to its membership, with director Andrew Haigh on hand to answer questions from his audience. Michael Guillén: You've entered my filmic awareness handling young, unknown actors or up-and-coming actors in Weekend (2011) and the television series Looking (2014-2015). Can you speak to how much of a contrast it was working with seasoned actors such as Charlotte Rampling and Tom Courtenay? Andrew Haigh: The weird thing was it was pretty much the same. I don't even know how you would speak differently to seasoned actors than unknown actors. It was through conversations that I realized I didn't need to treat them any differently whatsoever. In many ways 45 Years was made in the same way my first film was made, with a very small crew, not many people, remarkably similar. As a director, you create the space where actors can do their work and you let it happen. Charlotte, especially, is very good at understanding when something feels truthful or not in a script. That comes from experience. So when she doesn't think something is working, you know to sit back and adapt to change. Both Tom and Charlotte were really nervous the first day we started. I was shaking. Then I walked on set and Tom was just as nervous. Even though he's not that well-known, he's still been nominated at the Oscars®, and is an experienced actor, but you realize that even for them every new film they do is a new experience and they have to start fresh again. They have to be open to the experience.